As people age, cataracts are likely to form. The National Eye Institute (NEI) reports in a 2002 study that more than half of all United States residents 65 and older have a cataract. People who smoke are at a higher risk for cataracts. Increased exposure to sunlight without eye protection may also be a cause. Cataracts also can occur anytime because of injury, exposure to toxins, or diseases such as diabetes. Congenital cataracts are caused by genetic defects or developmental problems, or exposure to some contagious diseases during pregnancy. However, the most common form of cataract in the United States is age related. According to the NEI, cataracts are more common in women than in men, and Caucasians have cataracts more frequently than other races, especially as people age. People who live close to the equator also are at higher risk for cataracts because of increased sunlight exposure. More than 1.5 million cataract surgeries are performed in the United States each year. The NEI reports that the federal government, through Medicare , spends more than $3.4 billion each year treating cataracts. Cataract surgery is one of the most common surgeries performed, and also one of the safest and most effective. Phaco is currently the most popular version of cataract surgery. 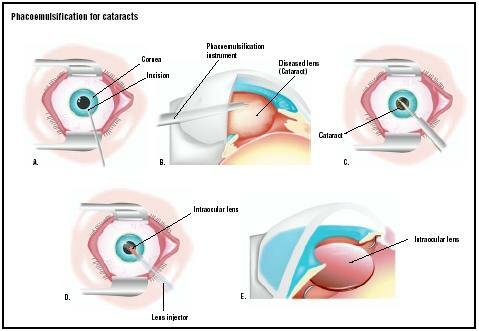 Phacoemulsification is a variation of extracapsular cataract extraction , a procedure in which the lens and the front portion of the capsule are removed. Formerly the most popular cataract surgery, the older method of extracapsular extraction involves a longer incision, about 0.4 in (10 mm), or almost half of the eye. Recovery from the larger incision extracapsular extraction also requires almost a week-long hospital stay after surgery, and limited physical activity for weeks or even months. Charles Kelman created phacoemulsification in the late 1960s. His goal was to remove the cataract with a smaller incision, less pain, and shorter recovery time. He discovered that the cataract could be broken up, or emulsified, into small pieces using an ultrasound tip. At first, phaco was slow to catch on because of its high learning curve. With its success rate and shorter recovery period, surgeons slowly learned the technique. Over the past decades, surgeons have constantly refined phaco to make it even safer and more successful. Innovations in technology such as the foldable IOL also have helped improve outcomes by allowing surgeons to make smaller incisions. breathe with the draping. The patient's blood pressure and heart rate also are likely to be monitored. Before making the incision, the surgeon inserts a long needle, usually through the lower eyelid, to anesthetize the area behind the eyeball. The surgeon then puts pressure on the eyeball with his or her hand or a weight to see if there is any bleeding (possibly caused by inserting the anesthetic). The pressure will stop this bleeding. This force also decreases intraocular pressure, which lowers the chances of complications. After applying the pressure, the surgeon looks through a microscope and makes an incision about 0.1 in (3 mm) on the side of the anesthetized cornea. As of 2003, surgeons are beginning to favor the temporal location for the incision because it has proved to be safer. The incision site also varies depending on the size and denseness of the cataract. Once the incision is made, a viscoelastic fluid is injected to reduce shock to the intraocular tissues. The surgeon then makes a microscopic circular incision in the membrane that surrounds the cataract; this part of the procedure is called capsulorhexis. A water stream then frees the cataract from the cortex. The surgeon inserts a small titanium needle, or phaco tip, into the cornea. The ultrasound waves from the phaco tip emulsify the cataract so that it can be removed by suction. The surgeon first focuses on the cataract's central nucleus, which is denser. While the cataract is being emulsified, the machine simultaneously aspirates the cataract through a small hole in the tip of the phaco probe. The surgeon then removes the cortex of the lens, but leaves the posterior capsule, which is used to support the intraocular lens. The folded IOL is inserted by an injector. The folded IOL means that a larger incision is not required. After the IOL is inserted into the capsular bag, the viscoelastic fluid is removed. No sutures are usually required after the surgery. Some surgeons may recommend that patients wear an eye shield immediately after the surgery. The entire procedure takes about 20 minutes. The phaco procedure itself takes only minutes. prefer a continuous "chop," while others divide the cataract into quadrants for removal. One procedure, called the "phaco flip," involves the surgeon inverting and then rotating the lens for removal. Advances in technology also may allow for even smaller incisions, some speculate as small as 0.05 in (1.4 mm). People might have cataracts for years before vision is impaired enough to warrant surgery. Eye doctors may first suggest eyeglasses to temporarily help improve vision. But as the lens grows cloudier, vision deteriorates. Cataracts grow faster in younger people or diabetics, so doctors will recommend surgery more quickly in those cases. Surgery may also be recommended sooner if the patient suffers from other eye diseases such as agerelated macular degeneration and if the cataract interferes with complete eye examination. When symptoms worsen to the point that everyday activities become problematic, surgery becomes necessary. A complete ocular exam will determine the severity of the cataract and what type of surgery the patient will receive. For some denser cataracts, the older method of extracapsular extraction is preferred. The diagnostic exam should include measurement of visual acuity under both low and high illumination, microscopic examination of eye structures and pupil dilation, assessment of visual fields, and measurement of intraocular pressure (IOP). If cataracts are detected in both eyes, each must be treated separately. Overall patient health must also be considered, and how it will affect the surgery's outcome. Surgeons may recommend a complete physical examination before surgery. Although preoperative instructions may vary, patients are usually required not to eat or drink anything after midnight the day of the surgery. Patients must disclose all medications to determine if they must be discontinued before surgery. Patients taking aspirin for blood thinning usually are asked to stop for two weeks before surgery. Blood-thinning medications may put patients at risk for intraocular bleeding or hemorrhage. Coumadin, the prescription medicine for blood thinning, might still be taken if the risk for stroke is high. People should consult with their eye doctor and internist to decide the best course of action. An A-scan measurement, which determines the length of the eyeball, will be performed. This helps determine the refractive power of the IOL. Other pre-surgical testing such as a chest x ray , blood work, or urinalysis may be requested if other medical problems are an issue. The surgeon may also request patients begin using antibiotic drops before the surgery to limit the chance of infection. Cataract surgery is done on an outpatient basis, so patients must arrange for someone to take them home after surgery. On the day of the surgery, doctors will review the pre-surgical tests and insert dilating eye drops, antibiotic drops, and a corticosteriod or nonsteroidal anti-inflammatory drop. Anesthetic eye drops will be given in both eyes to keep both eyes comfortable during surgery. A local anesthetic will be administered. Patients are awake for the surgery, but are kept in a relaxed state. The patient's eye is scrubbed prior to surgery and sterile drapes are placed over the shoulders and head. The patient is required to lie still and focus on the light of the operating microscope. A speculum is inserted to keep the eyelids open. Immediately following surgery, the patient is monitored in an outpatient recovery area. The patient is advised to rest for at least 24 hours, until he or she returns to the surgeon's office for follow-up. Only light meals are recommended on the day of surgery. The patient may still feel drowsy and may experience some eye pain or discomfort. Usually, over-the-counter medications are advised for pain relief, but patients should check with their doctors to see what is recommended. Other side effects such as severe pain, nausea, or vomiting should be reported to the surgeon immediately. There will be some changes in the eye during recovery. Patients may see dark spots, which should disappear a few weeks after surgery. There also might be some discharge and itching of the eye. Patients may use a warm, moist cloth for 15 minutes at a time for relief and to loosen the matter. All matter should be gently cleared away with a tissue, not a fingertip. Pain and sensitivity to light are also experienced after surgery. Some patients may also have slight drooping or bruising of the eye which will improve as the eye heals. Patients have their first postoperative visit the day after surgery. The surgeon will remove the eye shield and prescribe eye drops to prevent infections and control intraocular pressure. These eye drops are used for about a month after surgery. Patients are advised to wear an eye shield while sleeping, and refrain from rubbing the eye for at least two weeks. During that time, the doctor will give the patient special tinted sunglasses or request that he or she wear current prescription eyeglasses to prevent possible eye trauma from accidental rubbing or bumping. Unlike other types of cataract extraction, patients can resume normal activity almost immediately after phaco. Subsequent exams are usually at one week, three weeks, and six to eight weeks following surgery. This can change, however, depending on any complications or any unusual postoperative symptoms. After the healing process, the patient will probably need new corrective lenses, at least for close vision. While IOLs can remove the need for myopic correction, patients will probably need new lenses for close work. Complications are unlikely, but can occur. Patients may experience spontaneous bleeding from the wound and recurrent inflammation after surgery. Flashing, floaters, and double vision may also occur a few weeks after surgery. The surgeon should be notified immediately of these symptoms. Some can easily be treated, while others such as floaters may be a sign of a retinal detachment. Retinal detachment is one possible serious complication. The retina can become detached by the surgery if there is any weakness in the retina at the time of surgery. This complication may not occur for weeks or months. Infections are another potential complication, the most serious being endophthalmitis, which is an infection in the eyeball. This complication, once widely reported, is much more uncommon today because of newer surgery techniques and antibiotics . Patients may also be concerned that their IOL might become displaced, but newer designs of IOLs also have limited reports of intraocular lens dislocation. Other possible complications are the onset of glaucoma and, in very rare cases, blindness. It is possible that a secondary cataract may develop in the remaining back portion of the capsule. This can occur for as long as one to two years after surgery. YAG capsulotomy, using a laser, is most often used for the secondary cataract. This outpatient procedure requires no incision. The laser makes a small opening in the remaining back part of the lens to allow light to penetrate. Most patients have restored visual acuity after surgery, and some will have the best vision of their lives after the insertion of IOLs. Some patients will no longer require the use of eyeglasses or contact lenses after cataract surgery. Patients will also have better color and depth perception and be able to resume normal activities they may have stopped because of impaired vision from the cataract, such as driving, reading, or sports. Phacoemulsification has taken the previous risks from cataract surgery, making it a much safer procedure. Before phacoemulsification, death after cataract surgery was still rare, but usually stemmed from the possible complications of general anesthesia. Phaco is performed under local anesthesia, limiting the risk of general anesthetic use. Other serious complications such as blindness also have been reduced with the widespread use of phaco. Better antibiotics have enabled physicians to combat former debilitating infections that previously would have caused blindness. Extracapsular cataract extraction. While phaco is considered a type of extracapsular extraction, the older version of this technique requires a much larger incision and does not use the phaco machine. It is similar in that the lens and the front portion of the capsule are removed and the back part of the capsule remains. The surgeon might consider this technique if the patient has corneal disease or if the pupil becomes too small during the first stages of surgery. Intracapsular cataract extraction. This also requires a larger incision than phaco. It differs in that the lens and the entire capsule are removed. While it is the easiest cataract surgery for the surgeon technically, this method carries an increased risk for the patient with increased potential for detachment of the retina and swelling after surgery. Recovery is long and most patients will have to use large "cataract glasses" to see. See also Extracapsular cataract extraction . Buettner, Helmut, ed. Mayo Clinic on Vision and Eye Health. Rochester, MN: Mayo Clinic Health Information, 2002. Cassel, Gary H., Michael D. Billig, and Harry G. Randall. The Eye Book: A Complete Guide to Eye Disorders and Health. Baltimore, MD: Johns Hopkins University Press, 1998. Jaffe, Norman S., Mark S. Jaffe, and Gary F. Jaffe. Cataract Surgery and Its Complications, 6th Edition. St. Louis: Mosby, 1997. Massengill, R.K. Supersight: The Lens Implant Miracle. Boston, MA: Health Institute Press, 1987. Spaeth, George L., ed. Ophthalmic Surgery Principles and Practice. Philadelphia, PA: W.B. Saunders Company, 1982. "Cataract Surgery." EyeMdLink.com , [cited March 28, 2003]. 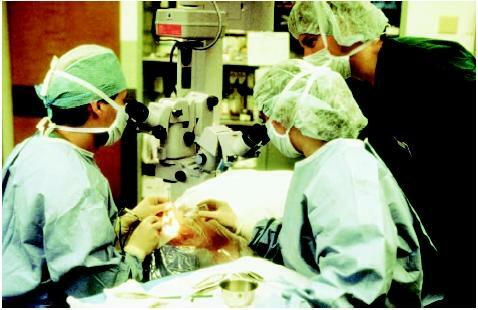 http://www.eyemdlink.com/EyeProcedure.asp.EyeProcedureID=19 . Samalonis, Lisa B. "Cataract Surgery Today." Eye World, February 2002 [cited March 28, 2003] http://www.eyeworld.org/feb02/0202p34.html . Ophthalmologists and optometrists may detect cataracts; however, only an ophthalmologist can perform cataract surgery. An anesthesiologist may be on hand during surgery to administer the local anesthetic. Surgical nurses will assist the ophthalmologist in the operating room and assist the patient preoperatively and postoperatively. Will Medicare pay for the surgery and my aftercare? If I have a cataract in the other eye, how long must I wait to have the other eye treated? Will I still need reading glasses after surgery? Will I still need eyeglasses to see far away even if you insert an intraocular lens? How many cataract surgeries have you performed? How many of these have been phacoemulsification? What precautions should I take to protect my eye after surgery? When can I resume my normal activities after surgery? Contact sports? Hi! this is interesting. I have gone through website reg. cataract surgery and found some interesting detail. Pls. go through. regards. this article is very usefull for my paper about phacoemulsification. i just wanna say thank you very much. I have enjoyed immensly the article. I have had two cataracts removed by the very skilled eye surgeon Dr. Erik Bergman. One was done in 2004. The other just yesterday, 2-6-08. Both have been beautifully done. I think everyone should check themselves to see that they are't plagued by a cataract; it's just too easy to have these professional eye surgeons do their professional best to make one's experience with cataracts a thing of the past, and give them back a "Life" again! I had pheco surgery two months ago. My vision is good. However I am having redness of the eye operated and also slight swelling on the eyelid. Thereby the operated eye looks a bit smaller than the other eye. I have been using various eye drops but the redness persists. Please advise. Well Done! Thank you for writing this article using the correct vocabulary, but with simple prose! My optician has informed me I have cataracts in both eyes. They have referred me to an opthalmologist. How do I know they are credible? I have an implanted pacemaker/defibrillator. I know that electrocautery can trigger the defibrillator and should be avoided. I would like to know if the ultrasonic generator used in phacoemulsification can trigger the unit too. Getting unwanted defibrillation during catarract surgery would be exceptionally dangerous. Does anyone have experience with this? Suffering from blurred vision,which developed after an accident,when the visor of the helmet cut in to my left eyebrow. When accumulated blood slowly dissolved a smallspot remained now that is causing blurred vision.PLEASE SUGGEST A CURE WITH THE HELP OF MEDICINE. Article is very informative.It is very suggestive for laymen going for cataract surgery. It is dependable.It develops confidence in patients.I express my gratitude for the publisher.But there need to be more for those one eyed. I got cataract operation done about a year & half. For the past 3 months, I have the obscure vision in my left eye & even with the eye glasses vision is dull. Can this be corrected again? Phacoemulsification ultrasound during cataract surgery will not effect a the pacemaker setting. Electrocautery should be avoided. If cautery is called for, local hand held battery powered would be safer. Moreover, prior to the procedure the make of the pacemaker should be determined and representative of the pacemaker company should examine the pacemaker to ensure proper functioning. Further an anesthetist standing by during the surgery would aid in dealing with increasing the safety of the surgery. Very helpul material for my paper on cataracts. Thank You! Great article. Now I can see in 3D again after cataract surgery with Phacoemulsification. Thank you! i had lasik on both eyes in 2000 for myopia (-8.0). in june i had phaco in the right eye and one week later in the left eye. initially everything seemed to be alright but after 2 weeks the severe degree of hypermetropia made the surgeon go for lens exchange. this happened in july and august. initilly again things were alright for almost 3 weeks and then suddenly, there was refraction error again and there was myopiv changes resulting in -4.5 in the left and -2.5 in the right. can anyone explain all this to me and suggest the best way forward now.? I had undergone thru this surgery for both of my eyes in 1999 and 2009 for right and left eyes respectively. I knew the process and experienced it. Still, the article is informative, conceptual, and eye opening! Cataract with foldable lens IOL implant is better, with small cut on eye, fast curable. Should be adapted if affordable. this is very useful article especially who are going to operate cataract operation.preoperative suggestions and postoperative suggestions are help to prevent from dangerous situations. Hi, Can one have the 2 eyes operated successfully having one near sight and the other far sight? How long does one have to wait to have surgery through the public system. Article is very useful for all informations we need to understand everything about cataract surgery. My mother has central retinal ablation of the left eye 20 years ago, unsucessfuly treated 2 times.Because of cataract she was told to have Laser treatment first and than cataract surgery of the same eye. A would like to ask how helpful will be cataract surgery, knowing that there is no central vision because of ablatio? Do the latest techniques in phacoemulsification can correct legal blindness? I have a friend who is 80 years old and has been legally blind in one eye since fragments of a bullet that was fired when he was only 8 years of age. By and large I have checked other websites and I have come up empty as they told me that there is no cure for legal blindness, not even with surgery. If there is no cure, could a powerful lens correct his vision otherwise? I hope that you can give us hope in giving us a positive answer, thank you. i had cataract operation in right eye on 14 nov 2011 which went on well. after surgery i am having a clear vision in right eye. on 23 nov 2011 i had cataract operation in left eye. during the operation light went off for a minute. after surgery when next day i went for post surgery check up. doctor had written in her report : 6/9 vision and air bubble in the upper side of the eye. my vision is quiet right in left eye but when i rest on the bed i am not been able to see the fan and it is all milky from left eye whereas with right eye my view is clear. I am afraid that my vision in left eye will be like this or this will become alright with time. when i asked my surgeon about this she said 6/9 vision is ok and this air bubble will go after some time. is it true or i am having some serious problem. is it anything to do with the light failure. because i remember when the light went off the doctor also paniked and was talking about vaccum failure. this air bubble is on the upper side of eye. will it remain there or it can come down or my front vision will also be affected in future. please give me the full info on this and also tell me why this happened. is it a normal happening in some cases and it will be all right after some time or not. kindly help. The article is very helpful, my friend have posterior subcapsular cataract in both eyes, may I ask he has to go for phacoemulsification for both eyes at once or one by one. now he is suffering from glare and blurry vision and also provide information that how mant percentage it will successful. This article is very helpful to the people, although every people will suffering from cataract due to aging processes. So this modern technique will help people to understand cataract surgery. I wish success of surgery every surgeon and patients. Once the Phaco is done at the early stage say about 35 years of age, can it again become cataract at the old age and the foldable lense will be of use or any other surgery is required. Because there are many foldable lenses are available including imported ones which are much costly. Can any body through some light on this pl and clarify my doubt. I have two question : 1-I'm myope ( -5, -6.5 ) in both eye , 51y diabetic on insulin -I have posterior capsular cataract Iin one eye so if phaco is decideddfor that eye what is options for other sound eye to correct refractionas operated eye (sound eye no cataract at all or retinal changes in botheye ) can Lasek be done ? 2-long follow up Nd percentage of post op complication ? wife has cochlear implant will ultrasound effect this device . THIS ARTICLE IS REALLY HELPFUL TO ME,,MY MOTHER HAS CATARACT IN HER LEFT EYE,AND SHE WANT PHACOEMULSIFICATION TREATMENT IN HER EYE,BUT SHE IS A DIABETIC PATIENT,IS THERE ANY RISK IN THIS OPERATION? It is very useful article on iol replacement. I have done in my right eye this month. Aoa, my mother has cataract in left eye matured Dr. Of eye suggested cataract phaco operation. My mother patient of high blood pressure and taking tab. Blokium 50mg daily for last five years. Is phaco cataract Is feasible. In Ireland, something called a DRG code for this procedure, including a lens implant, unilateral, is required for reimbursement. Can you tell me what is the correct code, or where I can find it ? The article is well written and easy to understand, but it is a little dated. Patients are not likely to breathe through an oxygen tube, as they are sedated, but awake. They will most probably only have oxygen delivered by tubing that inserts into the nose, much like the ones you see ex-smokers using. Also, you described a peri-bulbar block to deaden the eye. Some older surgeons still use this technique on a regular basis, but most of the time topical anesthetics are used. When the needle is used to deaden the area, then the eye has to be protected and the patient will go home with a patch and shield to protect it, and it won't come off until the next day. Is Phaco procedure safe to perform on old people ( 80 years old and above)?